Hmmm...all these our young ladies of today and their ways; only God knows what happened between she and the pastor in that hotel room, in the hours and minutes leading to her highly suspicious death. 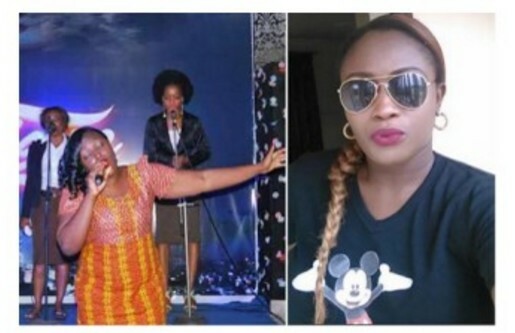 This young gospel singer, identified as Yvonne Omoarebokhae, has been found dead in a hotel room in Benin, the Edo State capital. The incident occurred last Friday in the hotel located in GRA Benin. It was learnt that the lady, who's married with a 3-year-old child, was allegedly carried away when the 'Pastor' sent her messages on Facebook with promises of helping her perform in many big events. Yvonne, who is a graduate of the Benson Idahosa University, was said to have lodged in the hotel along with the pastor, whose name was given as Apostle Psalm Okpe. According to the husband, Mr Odion, his wife met Apostle Okpe on Facebook and after a period of chatting, the pastor, last Thursday, invited her over for a "performance" in Asaba, Warri and Benin. The last time he spoke with his wife was 10am on Friday, she told him that she would soon be home. But to his surprise, at about 9:30pm on the same Friday, the police used his late wife's phone number to call him that he should report at Airport Road police station in Benin. The words of the husband: "I waited for more than two hours at the police station until the police asked me to go home but I insisted on knowing the whereabouts of my wife. Edo State police commissioner, Chris Ezike, confirmed the death of the young lady, adding that the pastor has been arrested. One fact that is hidden in this saga is that: this married lady and her husband live in Benin, yet she went and lodge with a so called 'Pastor' in a hotel in the same Benin. We are waiting for the whole truth.